After what amounted to a pretty busy week, I decided to spend a quiet evening with my girlfriend, rewatching an episode of Psych titled, “Mr. Yin Presents,” (season 4 finale).It’s more or less a sequel to “An Evening With Mr. Yang,” (season 3 finale) which kept the audience hanging off a cliff for the better part of a year. What I liked about this show was each episode was book-ended until the later seasons. That is — after watching the first couple episodes, you could pick up anywhere and could still follow along. But these two episodes in particular gave us a glimpse of what it’d be like to deal with a real life serial killer, who as Jigsaw from Saw put it — “wants to play a game” with the Santa Barbara Police Department (where the show takes place.) We always have the debate as to which episode is better. Well…that depends on your taste. SBPD get a note alerting them a serial killer only known as, the Yin Yang killer, has resurfaced after a string of murders that went cold in 1995. Shawn and Gus are called to the station on the orders that the killer has singled them out to play a string of cat-and-mouse riddles. The police profiler, Mary Lightly, explains that the killer challenges the cops to save the lives of his victims if they agree to the rules. The rules are clear, and the game begins. In what’s usually a comedy premise, gets a little bit more intense as the killer begins to target the people in Shawn’s own life. Shawn becomes conflicted to stay involved as the stakes escalate to nosebleed levels, and ultimately gets forced back in after the killer takes his mom hostage. *SPOILER*: In a race-the-clock ending, Shawn catches the killer in a drive-in movie theater, with a twisted admiration for Shawn and his family. Mr. Yang who ends up being a female tells Shawn she’s planning on writing a book about them, before getting arrested. The climax has Mr Yang strapping Shawn’s mom with a bomb. Admittedly, I’m a sucker for almost any cat-and-mouse plot device. Die Hard 3 does a successful job with that. The video game, Heavy Rain, is probably my benchmark for this plot. It’s fun. It’s stylized. It keeps the audience guessing, as Mr. Yang does. It’s also the first time we see the main character, who’s usually a cut up, begin to turn serious and gives some texture to him. But on the flip side, there is the sequel. The sequel is one of the best, if notthe best episodes among the series. Mr. Yin Presents, starts off with Shawn arriving late to meet Gus for a screening of Psycho. On the way out, they end up running into the profiler Mary Lightly, who invites them to a diner to discuss Yang’s book that has just been released, noting that Yang couldn’t have been working alone. They don’t believe it, brush it off, and then later find the waitress who served them their pie is found murdered — with her body in the form of a yin/yang symbol. They go back to the diner, with Mary finding a crossword puzzle covered under a yin/yang etched glass cake stand. It’s later discovered the answer to the crossword is a character from a Hitchcock film. The clues take them back to the theater, realizing the killer was in the theater at the exact time Shawn and Gus were. Mary now explains Yin is acting alone and unlike Yang, has no rules. It’s complete chaos. In one of the best tributes to Alfred Hitchcock’s many films, the plot takes you into a parallel journey into a Hitchcockian nightmare. Yin (who has an affinity for Hitchcock), forces his opponents to act out certain iconic scenes from Hitchcock, with deadly consequences. As I mentioned earlier, part of what I enjoyed about Yang was that you get to see Shawn in a more serious light. If anything, this one ups the ante. Shawn is forced to choose between saving the life of his girlfriend, or the woman he’s been holding a torch for the last 3 seasons. He can only save one. The ending is a mixed bag of anxiety, relief, and sadness. Truthfully, I haven’t seen enough of Hitchcock’s work to decipher what movies were inspired by which scenes, other than the obvious being Rear Window,Vertigo, and a few others. In some cases, they do a shot-by- shot recreation in a really unique way that weaves into the plot flawlessly. They also play out the theme that’s common in Hitchcock classics. That is — you get lulled into that false sense of security; you get played like a piano, almost beautifully. It’s a tough call on which one I favor, and still one I’m on the fence about. I can see merit to both of them. The first one gives you that chilling reminder that sometimes the bad guys have the upper hand. A real life example of this is The Zodiac killer, who forced the San Francisco’s press to publish their encrypted messages, or they would blow up a bus full of innocent children. The sequel though is just so well done, that it’s hard to argue about its simple brilliance. The cinematography. The premise. The flashbacks to the first one that make you rethink everything you just witnessed. 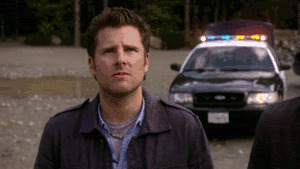 Interesting tidbit, the main star (James Roday) who plays Shawn was the co-writer and director for this particular episode. The fact that he does it justice is a true testament to his ability. For now, I’m going to cop-out, and throw it into my too hard pile. However, after watching them both, I think I can find some inspiration for my next episode of Shoe Factory Road. Watch them both, and tell me which one you think is better.